I know this picture isn't great, but I've got a 2 year old kid and a regular old point and shoot digital camera, the fact that she is more than just a blur is a miracle. After she realized they squeaked she was in love and danced around the house and stomped and played until it was time for church. Now, we learned with the last pair of shoes that squeakers during a pot luck after church, AWESOME! we always knew where she was. However, squeakers during the reverent Sacrament meeting...embarrassing. So Chris casually slipped the squeaker insert out as he was unbuckling her and getting her out of the car. (At least that's when I assumed he did it, because I never noticed.) Sarah didn't notice either until the sacrament was being passed and the room is dead silent and she starts stomping her foot. Then she looks down and realizes no noise is coming out. She looks up and me and says, "They're broken! Look!" and then she starts stomping her feet, "See! They're broken." as she held her foot up to me. I just about died from laughing over how distraught she was. She was telling everyone about it on the way to nursery. One of my good friends, Eliza, told me she had a detailed conversation with Sarah about her shoes. Sarah told her all about how they were broken and demonstrated the lack of noise when she walked. Luckily, after church Daddy fixed them and slipped the squeaker back in. She was elated. "I fixed it!" she exclaimed and proceeded to stomp and dance and make all kids of noise. Later we went over to Grandma and Grandpa Schwartz's house to say goodbye to GG and GP Wright and she had a whole new audience to demonstrate her awesome shoes for. The best quote of the night was from Uncle Adam after Sarah had been chasing the older boys around with her baby dolls when he told H1 and H2 "do you hear any squeaking? Then you're safe and she's not coming to get you." 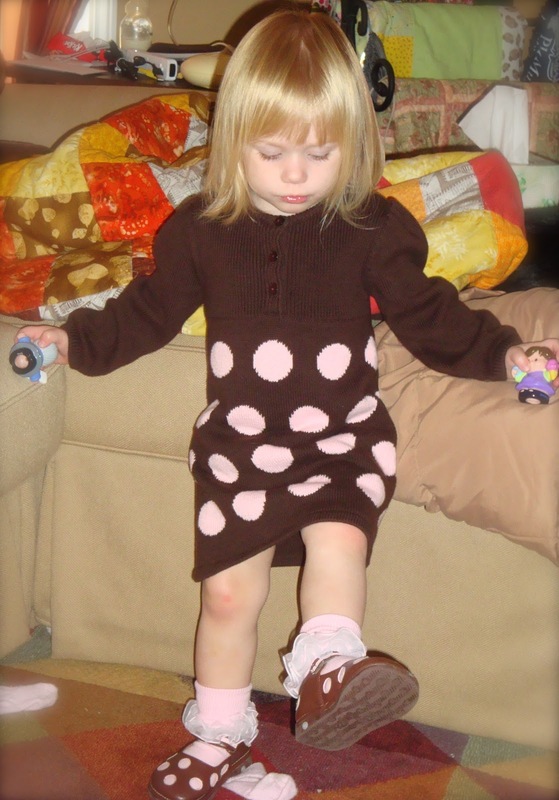 Which Sarah must have realized that her shoes were giving her away because later when she was playing hide and go seek with Grandpa she got down on her knees and started crawling so he wouldn't know where to find her. Of course, her giggle because she thinks she's hilarious gave her away. I just love her fun personality! And because he shouldn't be left out. Here's my little lady's (bug) man. Just relaxing in Sissy's room while everyone is trying to get ready for church.